As a transportation reporter, I’ve been in a lot of cars using either autonomous or semi-automated Advanced Driver Assistance (ADAS) features, both on public and private roads, and yet I’d never been in an accident during a demonstration drive for any of these features before now. 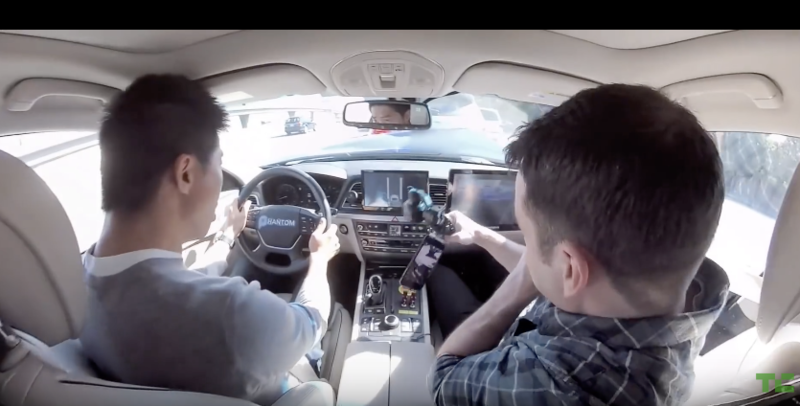 On Tuesday, January 30, myself and two TechCrunch video production staff were riding in a modified Hyundai Genesis equipped with technology created by autonomous systems startup Phantom AI, traveling south on Bayshore Freeway near Millbrae, CA. In addition to the three TechCrunch staff, there were also two Phantom AI team members in the car, including founder and CEO Hyunggi Cho, and President and co-founder Chan Kyu Lee. Lee was at the wheel during the test, which was a demonstration of the startup’s Autopilot-like SAE Level 2 partial autonomous system, designed to maintain lane position, maintain distance between itself and vehicles ahead, and switch lanes automatically once directed using the turning indicator. During the demonstration, while the L2 system was engaged and we were traveling at 60 MPH according to Phantom AI (though the human-machine interface in the video above shows 70 MPH as our set cruising speed), a pickup truck ahead dropped a poorly secured garbage bin from its cargo bed onto the roadway. The car in front, a white Nissan Rogue, applied the brakes to prevent hitting the trash bin, and our driver noticed the sudden stop and applied the brake in the Genesis with force to attempt to prevent a collision, but there was very little he could do at that stage and our car collided with the Nissan going approximately 20 MPH. 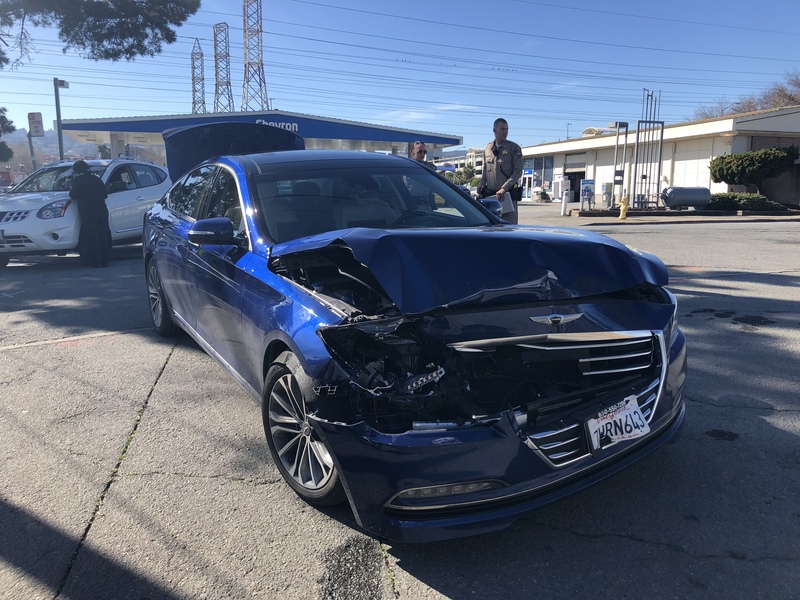 The Genesis suffered significant damage to the front end, as you can see above, though it was still technically drivable (but did begin leaking radiator fluid) and we first pulled to the shoulder as instructed by the California Highway Patrol, who were on the scene nearly immediately. We were then directed by the Patrol to a Chevron station just beyond a nearby exit, where we parked on the shoulder of a turnaround and gave our contact information to a patrolman, while the drivers involved provided full statements to the authorities. Cho told us that the Automatic Emergency Braking system would’ve normally engaged at that point and prevented the collision, but it was disabled for the demo because it had been throwing too many false positives and was undergoing tuning. Lee’s manual disengagement, which resulted from pressing the brake pedal to the floor, as you can see in the video, didn’t occur fast enough for us to shed all our speed. Cho immediately made sure no one was hurt (we weren’t, just shaken up) and after being cleared to leave the scene, we decided to follow through and move to an area of Foster City, where we rode in the startup’s Level 4 autonomous test car (a separate Genesis) around sparsely populated residential streets without incident. That may seem like an odd choice given we’d just experienced an accident riding in a car equipped with a different version of the company’s technology, but the follow-up demo was a separate system, speeds were much lower and there was a different safety driver at the wheel, and we were also honestly just all a little rattled and confused following the collision. We provided Phantom AI with the opportunity to supply a full account of what occurred from their perspective, based on reviewing the data from the vehicle, and they supplied a breakdown of what occurred from their perspective, which you can read in full below. The video at the top of this article also documents the crash from within the vehicle, using a Rylo 360-degree camera. Footage was trimmed for length and exported to 1080P frames from a 4K 360-degree source automatically using Rylo’s software, and the license plate of the vehicle hit was obscured for privacy, but otherwise the footage is unedited. We were conducting a demo of the Adaptive Cruise Control (ACC) feature, and Lane Keeping Assist (LKA) feature of our L2 system. Our Automatic Emergency Braking (AEB) functionality was disabled for demo purpose. For a frame of reference we’ll use the moment of impact at t, and express the time line in t minus x seconds. t minus 3 to t: Braking was applied as strong as possible, with braking force : 5~6m/s^2 (you can see from the speedometer we went from 60MPH -> 25MPH for 3 seconds). As you can see the driver was doing everything he could within these 3 seconds, expecting an impact. So our driver could’ve clearly had a slightly faster reaction time, applied brake 1-1.5 seconds earlier, and braked harder since the maximum possible braking of a vehicle is about 8m/s^2. But at that instant since he had you, a reporter in the car, he was clearly overwhelmed and the anxiety caused the slight delay in reaction time for decision making. In hindsight we should’ve enabled our emergency braking functionality, as this would’ve been a rare opportunity to test/demonstrate our automated braking system which would’ve braked harder than the human driver. What happened was an unfortunate minor incident that we had a human driving error which had we enabled our full system, could have been avoided.